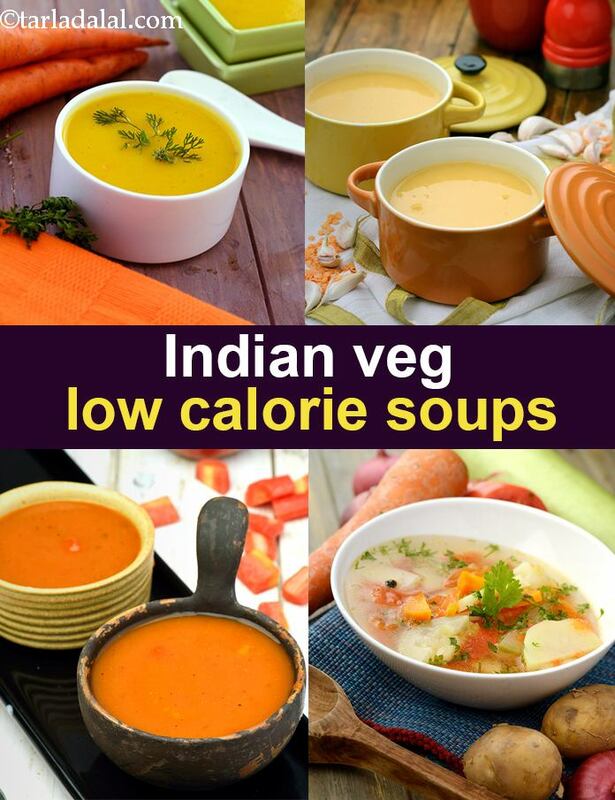 Low Calorie Soups, Indian Veg Low Fat Soups. Soups can be made low-calorie but still taste delicious! Soups reinforced with cream, corn flour, plain flour, etc., do have a fantastic flavour but when you have them in larger quantities as a snack, you are likely to be riddled with the guilt of adding to your waistline! Shift to options like Carrot Soup, Healthy Lentil Soup, Nourishing Barley Soup, Whey Soup, Chinese Vegetable Clear Soup, Moong Soup etc., which will give you the same delightful experience without any guilt. We present you a range of Low calorie soups, low calorie Indian soups from 16 calories to 114 calories. The beauty is that these low cal soups are very healthy. So make a soup from the below list and let us know if you enjoyed them. Low calorie Palak (Spinach) Indian Soups. Palak is cheap and always present in Indian kitchens. You will thoroughly enjoy this nutrient-dense, easy-to-prepare low calorie spinach soup recipe. Cooking it with low-fat milk gives it a lovely emerald green colour, which together with the aroma of sautéed onions and garlic, makes this soup irresistible! 49 calories for low cal spinach soup is especially recommended for all the weight-conscious readers. A slightly richer option is spinach paneer and dal soup recipe. This recipe uses low fat paneer which is perfect for diabetes, heart and weight loss. Since paneer is low in carbs and high in protein it gets digested slowly and hence good for diabetes. At 72 calories for spinach paneer and dal soup, this recipe is a perfect low cal Indian soup. Those who love the garlic flavour, try our spinch and garlic soup recipe made with low fat milk. At 37 calories for the spinach garlic soup, it's a perfect way to loose weight in a healthy way. Low Calorie Tomato Soups. Here is another popular Indian soup which does not have loads of calories. Tomatoes are cheap and always there in Indian kitchens. Indian's mix tomatoes with yellow moong dal to make veg tomato soup recipe with only 53 calories for tomato soup. You want a better option then make this healthy tomato soup recipe which is without any sugar. Guaranteed to rejuvenate you on a tiring day, this soothing Moong Soup is mildly flavoured with a tempering of cumin seeds and curry leaves. Chock-full of Protein, Iron and fibre, this variant of the traditional recipe is made Diabetic-friendly by using just a teaspoon of oil. Enjoy this easy-to-digest yet sumptuous soup hot and fresh for the best consistency. Low Calorie Moong Soups. Again moong (whole green gram) is always available in Indian kitchens. This moong soup recipe is nourishing and perfect when its cold or you have a slight bug in your body with just 110 calories for the moong soup. Another healthy option is the moong soup with paneer with just 114 cal for moong paneer soup. We love this nourishing moong soup which is like a clear soup made of moong only. You can optionally add some low fat paneer and carrot to this if you want some mouth feel to it. I prefer it plain. Low Calorie Veg Clear Soups with an Indian touch. You can do no wrong with this mix vegetable clear soup which is perfect to clear your cold and cough. No added cornflour or sugar here. Whether you call it a nutritious clear soup, or a refreshing cuppa of tea, this Hot Mushroom Tea is a perfect choice to soothe and rejuvenate yourself for the endless challenges you need to meet every day. Flavoured mildly with pepper, this soup can be prepared quite quickly if you have cleaned and chopped mushrooms on hand. Only 16 calories for this low cal mushrom tea. Enjoy our Low Calorie Soups, Indian Veg Low Fat Soups and other soup recipe articles below.